This "Historically Speaking" column was published in the Exeter News-Letter on Friday, February 1, 2019. “Wanted,” advertised Levi Clarke of Stratham, “a boy, about 15 or 16 years of age, to serve as an Apprentice at the Clothier’s business.” Clarke, like many tradesmen in the early years of America, needed trained help. His business, in 1793 when the ad was placed in Exeter in the American Herald of Freedom, required skills that would take years to learn. Taking on an apprentice would allow Clarke to train a successor and had the added benefit of providing labor while that training was happening. It was rare for girls to become apprentices. They were often sent to work at other people’s homes, and sometimes this was beneficial – working for a woman who was an expert knitter might allow a girl to learn the skill herself. But girls were learning household skills that weren’t considered breadwinner professions. A woman needed to master a staggering amount of skills before she could even consider running her own household. Just the cooking alone required her to have knowledge of food production, preservation (which itself included smoking, salting, pickling and fermenting – all separate skills) and preparation. To this was added the enormous task of clothing production and upkeep – many women spun their own thread, wove their own cloth, knit their own stockings and cut and sewed garments for the entire household. Laundry took two days to complete. All of these tasks had to be done while simultaneously producing, nursing and raising children at an average pace of one every two years. A few daughters, or a few neighbor’s daughters, would really help lighten the load. In exchange for their work, girls were learning important skills that they would later need. But even though there was a clear exchange of labor for training, it is rare to find an apprenticeship contract for women’s work. There are two apprentice indentures in the collections of the Exeter Historical Society. In 1894, Jonathan Robinson, at the age of 15, was old enough to sign his own apprentice contract with the consent of his father Edward Robinson. Young Robinson agreed to “voluntarily bind himself apprentice to Peter Judkins of Brentwood…to learn the art trade and mystery of a shop and house joiner…during the term of five years three months.” A joiner practiced the specialized branch of carpentry that included making window and door frames, stairs, furniture, bookcases, shelving and the like. During his time with Judkins, Robinson had to agree to “faithfully serve the said Peter Judkins, keep his secrets and at all times obey his lawful commands without damaging his said master in any way whatsoever.” He was forbidden from committing “fornication nor contract matrimony within said time. He shall not misspend his time nor absent himself from his masters business without leave but in all things behave himself as a faithful apprentice ought to do.” In exchange, Judkins was to provide “instructions both in shop & house joiner work…and provide him suitable food & raiment (clothing) washing and lodging & nursing of sick. Said apprentice to be learnt to read, write a good legible hand, and to cypher through the rule of three.” At the end of his term, the apprentice was rewarded with two suits of clothes. Judkins was getting a pretty good deal here – Robinson’s signature indicates that he already wrote “a good legible hand” hinting that his book learning was probably well taken care of. Bookkeeping was an essential part of the tradesman’s job. Five years and three months of training was a reasonable amount of time to learn the trade and would find Robinson, at the conclusion, 21 years old and ready to work on his own. Whether Samuel Lord ever became a weaver is unknown. National events subsumed the apprentice indenture his father had contracted when Samuel was a toddler. Mary, Kimball’s wife, died when Samuel was still young. The American Revolution broke out and Kimball was tasked with raising a militia in Brentwood. In 1779, while still a teenager and five years short of the end of his indenture, Samuel Lord joined up. His pay was later signed for by his master, Porter Kimball. After that, we lose track of Samuel Lord. He does not appear to have remained in Porter Kimball’s family. Some apprenticeships were never completed. If things weren’t working out – maybe the task didn’t suit the boy – the agreement could be nulled by mutual agreement. Sometimes a boy might be placed in multiple apprenticeships until a good fit was found. More often, the boy would run away. 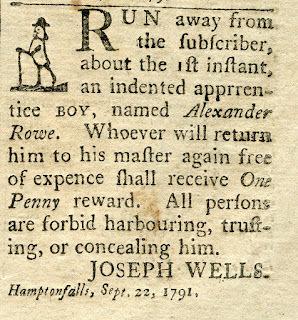 Newspapers were filled with notices of runaway apprentices. Finding good help was just as frustrating in early America as it can be today. 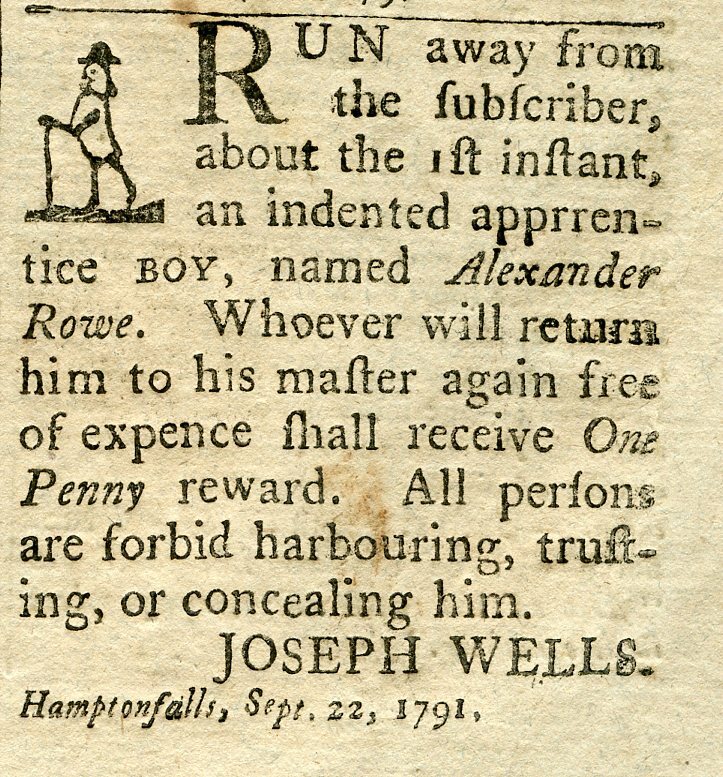 Image: As this advertisement from the October 7, 1791 New Hampshire Gazetteer indicates, apprentices sometimes ran away from a master.